The Eaton Center is a skyscraper in downtown Cleveland, Ohio. The building has 28 stories and rises to a height of 356 ft (109 m). 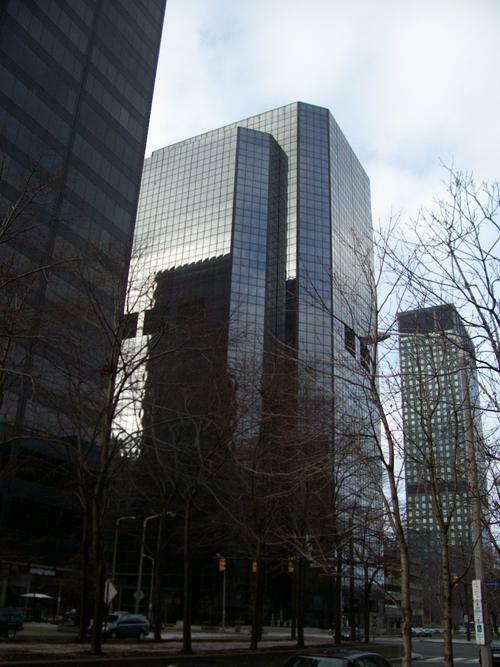 The structure, was one of the structures that expanded Cleveland's central business district eastward in the early-1980s building boom in the city. The decision for Eaton Center started in 1978, when St. John's College, which at the time was owned by the Roman Catholic Diocese of Cleveland experienced a downturn in enrollment. St. John's College built a dormitory in 1964, but this did not help, the dormitory became offices for the Catholic Diocese of Cleveland. In 2007, this complex was demolished for parking for the Avenue Apartments. With St. John's college merging with Ursuline College in 1978, the St. John's College building went vacant. Bishop James Hickey reading and hearing Cleveland's corporate community needing space offered the St. John's College land to any developer who would develop it into office space. This deal had one little problem, in October 1980 as papers were signed Pope John Paul II appointed Bishop James Hickey as Archbishop of Washington, DC, so Hickey's successor Bishop Anthony Pilla went with deal. The deal was this, St.